Think your newly-installed equipment will last as long as the manufacturer says? Don’t always count on it. A variety of factors can significantly cut into your equipment’s lifespan. Based on our experience in the field, we’ve listed the top five ways UPS preventative maintenance can uncover weaknesses. From a myriad of internal components to the environment in which they’re kept, UPS systems are complex. Without the proper UPS maintenance, problems are likely to arise. Yearly routine maintenance checks can ensure your facility runs seamlessly and help prevent costly downtime. 1. Minimizes downtime due to battery failure – The number one cause for UPS failure and load loss is battery failure. 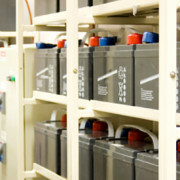 Fortunately, battery failure can almost always be predicted by having your batteries inspected at least twice per year. Preventative maintenance includes visual inspection, thermal image scans and comprehensive testing with state-of-the-art battery analyzers like the Midtronics or Alber systems to check impedance, AC ripple and other tests to determine the health of your battery system. If tests show any irregularities, we can help determine if your battery string is failing or perhaps has an open cell or short. Then we’ll help to provide a recommendation on when you should replace your batteries. 3. Identifies poor environmental conditions – A poorly designed or maintained electrical infrastructure can cost your facility thousands of dollars in wasted energy every year. That’s why mission-critical facilities should be constructed in a way that the walls, floor, doors and ceiling, are hermetically sealed. Not all facilities are that lucky, though. Often, we see dirty or caustic environments and exposure to the elements. A maintenance provider should also be a solutions provider, identifying inefficiently operating equipment, dangerous or poor environmental conditions, and offering appropriate recommendations for your facility and application. 4. Ensures generator functions properly – Although most generators are designed as a secondary source of power, they must be properly maintained to function when needed. Similar to an automobile, a generator’s engine depends on a battery, which requires maintenance to ensure optimal performance. The most common cause of a generator system failure is battery failure, which once again stems from little or no maintenance and often age. Maintenance testing also ensures the generator is properly sized, configured, and maintained to support the UPS, AC and mission-critical infrastructure. While this is not part of a UPS maintenance inspection, it is critical that your facility maintains the infrastructure supporting your critical loads. 5. Ensures faster downtime response – Unfortunately, no matter the level of prevention, power outages can and do happen. If your facility experiences a sudden power outage, time will be of the essence to saving your load and money. That’s where it is essential to have a UPS maintenance provider that is familiar with your equipment and facility, who can respond to your emergencies with urgency and confidence. Having a solutions provider on your side is crucial in getting your operations back online and minimizing disruption. Turn the five potential points of failure into five ways UPS preventative maintenance can save the day. Something as simple as routine preventative maintenance checks each year can ensure your facility, UPS and your business keep running smoothly. By designing an effective preventive maintenance (PM) program, organisations can get back many amazing improvements in their overall UPS, including increases productivity, decrease waste, improved work execution and reduced unexpected breakdowns. So think about it right now if you want your UPS always in a good working conditions. Thanks QP so much for this wonderful sharing. Proper maintenance and thorough checking are the best preventive measures anyone can apply to their UPS.Make sure to implement these caring tips for a longer usage of your uninterruptible power supply. Three Ways to Choose the Best UPS Service Provider Line Interactive vs. Double Conversion UPS – Which One’s Best?